This is the second in a series of seven posts about working on yourself in order to more fully appreciate and get the best out of yourself and other people. You can read the first post here. 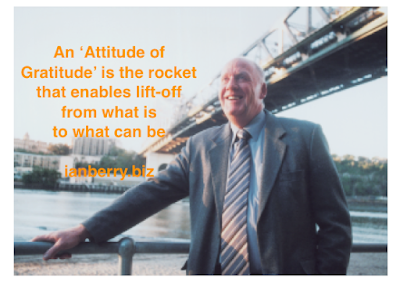 Every day since, at least 3 times a day, I stand in front of a mirror and say out loud "I have an attitude of gratitude." My stance helped me to not die from my illness. Every day since it has helped me, even in my darkness moments, deep disappointments, and digression from my path, to live a life that matters to me and the people I encounter. The day I received my doctors advice and began to apply it was a defining moment in my life. I use my ‘attitude of gratitude’ ritual too as a restart button whenever situations threaten my core appreciation of myself. Restarting helps me to bring to the forefront of my mind an unchanging principle I’ve learned the hard way - when we’re grateful for what we’ve got, we can have more of what we want. Over the long haul too I’ve been fascinated and enriched by another way this principle plays out - the more grateful I am for what is, means what can be becomes crystal clear, and therefore the pathway to achieving it also reveals itself. Start each day, before you turn your computer on, or do anything else, making a list of what you’re grateful for right now. Start with yourself personally, other people, and then things in general. Take the intentions, feelings, and thoughts that arise into every action and transaction. PS At this link you find the videos and first and second working on your business exercises that I recommend you undertake in conjunction with the working on yourself suggestions. Just watch the short videos and download the handbook at the link.